The Paper Orchard: Sunny Studio New Release Blog Hop + Birthday Celebration Giveaway! Super-cute card design! The colorful fish are a fun touch. Love the new stamps from Sunny Studios. So cute! Love the amazing coloring and the sentiment is too sweet! Loving the new release! Seal-iously CUTE!! Love this fun little scene with the colorful fish!! Cute, cute card! Especially love the background you did. Such a sweet stamp set! Love the fishing pole and fish! Thanks! The rainbow fish and your background are fantastic! Cute!!! I love your rainbow fish! Gosh...I just LOVE those seals. Super cute card! So adorable! I love the touch of color ith the rainbow fish! Brilliant! I just love your card! That rainbow of fishies really pops against the rest of your wintery scene. So hard to pick a favorite from this release, but I do love the playful polar bears! Super cute card, love the sentiment! I would love that sentiment in my craftroom - you did such an awesome job on this card! Love it - everything about it! TFS and for the hop - Happy Birthday!! Such a cute card! I love that little seal! thanks for sharing your talent with us! That little seal is the cutest! Love how you framed out this sweet scene. Adorable birthday card! That stamp images is so sweet! Thank you for sharing your lovely card. I think I need to own that cute stamp set. Lol....Thanks for sharing!! Such a cute card...I love the fireplace die set from this release..but there are so many choices!! Happy birthday to Sunny Studios! Amazing scene and those fish all colored up just pops right out at you! Fantastic!! Christmas Home and Frosty Flurries are my favorites. Like that you added a pop of color to the scene with the fish and texture with the floss. Thanks for sharing. Love the rainbow fish and the seal on top of the igloo! Very cute!! I'm in love with the cute seal and the colorful fish. Wonderful snowy background you've created, too! I really like the way you created the background with the distress inks and snowflakes. And that seal is so cute. I'm in love with that little seal! What a lovely card ! The way you colored the "white" baby seal is fantastic. Oh so cute! Love the background! I am in LOVE with this little seal and his string of fishies! Cute. Cute! CUTE!! My favorite is the Christmas Chapel set. Such a cute card and great for a winter birthday! Lovely card! Adorable seal with colorful fishes. Makes me smile. Soooo cute! Love those rainbow fish! Such a cute card. Love the seal and his little fishes. So adorable! Love the rainbow fish too! Thanks for the inspiration and giveaway! So adorable! My favorite stamp set is the one you used, Polar Playmates Stamp set! I just think that the seal is too adorable not to love (and have, lol)! Thank you for the inspiration and the chance at the giveaway! Great card! Going to pull this set out today. I have my eye on the church stamp. Lots of Christmas card ideas spring to mind on that one! These stamps are so darn cute. I love it! Very cute card. The multiple colored fish are so fun. Thank you for sharing. Love how you created this cute scene and those fishy's dangling off the pole. My favorite set is Christmas Home. I have several Winter Birthday relatives and friends, and this set would be perfect. I love how you colored each fish a happy bright color. So cute. Love the rainbow fishys. Very cute card, rainbow fish and all! I love it! 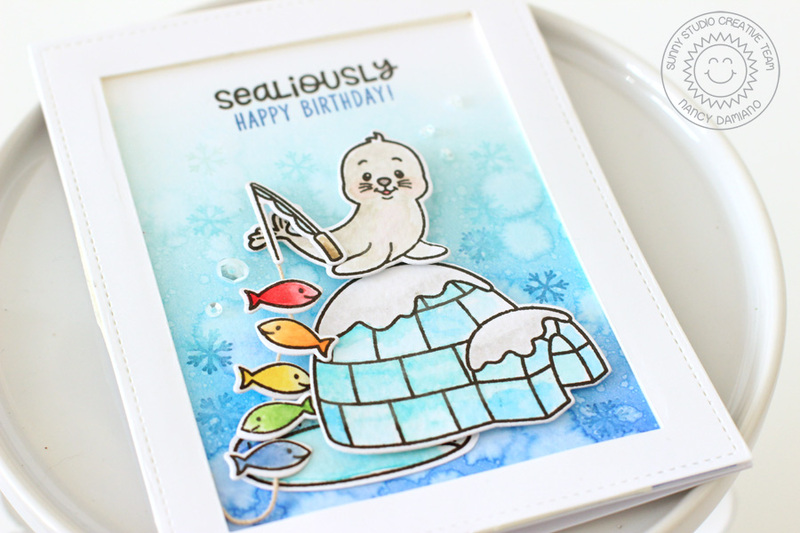 the design and the cute fishing seal with the fun sentiment...FUN! Adorable card! I think my fave is Polar playmates! The characters are just adorable! Happy Anniversary Sunny Studios! I love your products and this release is so much fun! Nancy this is soooo cute!!! Really adorable scene and I love all the gorgeous rainbow fish! How adorable! Love the fishing line with the "rainbow" trout...haha! What a sealiously cute card. Love it. I think my favorite set is the Fireplace die set. So cute...especially like the way you colored all the fish a different color! AND happy birthday Sunny Studios. So much cuteness in this blog hop. I love the string of fish in rainbow of colors. Really cute card. Thank you for sharing. Your card is so cute! I'm torn between Christmas Home and Jolly Gingerbread. So cute. The colorful fish are a nice touch. The background is great. This set is versatile and is perfect for someone with a winter Birthday. So cute! Love the way you used this to create a wintery birthday card! I have a few winter birthdays and this idea is great. I think my favorite from this release will be the poinsettia stamp and die. Poinsettias are always my favorite winter flowers. Awesome colors on this sweet card! The fireplace set is my favorite! 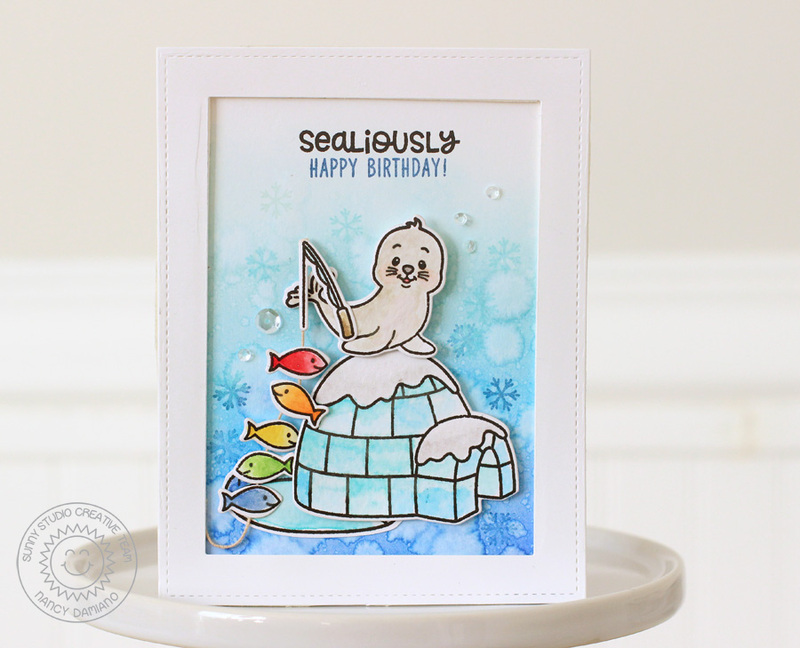 A "sealiously" sweet card Nancy! I love this set. I like that little snowflake stamp! I love your card! The background is so pretty and I love the rainbow fish! Cute card. Love the colorful fish in the scene. This has to be my favorite set from the release!!! That seal has stolen my heart and is demanding that I bring him home with me...(yes, stamps sometimes talk to me and I always listen when the do) 🤣🤣 Your card is absolutely adorable!! Thanks for the inspiration!! I love this stamp set!!! Such a stinkin' cute card!! love your rainbow string of fish! My favorite from the release is the chapel, just because I don't have anything like it in my collection (slowly building up my supplies). Also in the running is the houses and the gingerbread, plus the fireplace die set. Too many choices! I love that this one also has the birthday sentiment. Polar playmates is my favorite set of this release. This card is awesome. The string of multi colored fish is a cute addition. I can't wait to get it. That's a super cute card perfectly executed ! My favorites stamps sets are the Playfuk Polar Bear equally with the Christmas Chapel. Very cute!! I love the fish. Adorable!! My favorite set would have to be the fireplace. All the sets are adorable, but that one is so unique!! So many possibilities!! Oh how cute is this! That little seal pup caught himself a rainbow of fish! So cute--love the rainbow of fish. My favorite is the Christmas Chapel. Love the sentiment and your soft background - adorable! Such a lovely card !! Super cute!!! I love those colored fish and such a great background on this card!! The festive greetings stamp set is my favourite! Love the rainbow of fish he caught. Super cute!! Beautiful card! My fave stamp set so far is the chapel! This is a Sealiously cute card! I think the seals and igloo are just adorable. I am thinking the igloo looks even better in person with the Wink of Stella making it sparkle. I choose this one...the string of fish did it!!! Really amazing card. Love the image. i just fall in love with this stamp set! How cute is that! Great card. Love your seal card - adorable! Sunny Studio has the cutest stamps! Adorable birthday card! I love your pops of colorful fish! The background is beautiful- I can see that as a great holiday card with a ton of snowflakes. I think the fireplace die set is my favorite of the new release- it's so versatile and unique. This is so cute!! I love the background. Love that you have used the snowflakes. The fireplace die us definitely my favorite. Fireplaces are so nice for Christmas cards. Polar playmates is definitely my favourite set, but everything is fantastic in this release! Your card is so adorable - love the colourful fish you used! This card is so fun and bright! The colors for this card are so cute and well done!! Love the way you used the images and that string of rainbow fish has got me totally smiling!! Love your work!! Very cute card. I love the colored fish too!!! Too cute. Love the coloured fish. Thanks for sharing. Awe love that Pun.... such a cute card! That Seal is adorable! Can this get any cuter?! I love the colorful fish! Super job!